Use a sharp knife to cut the butternut squash lengthwise in half. 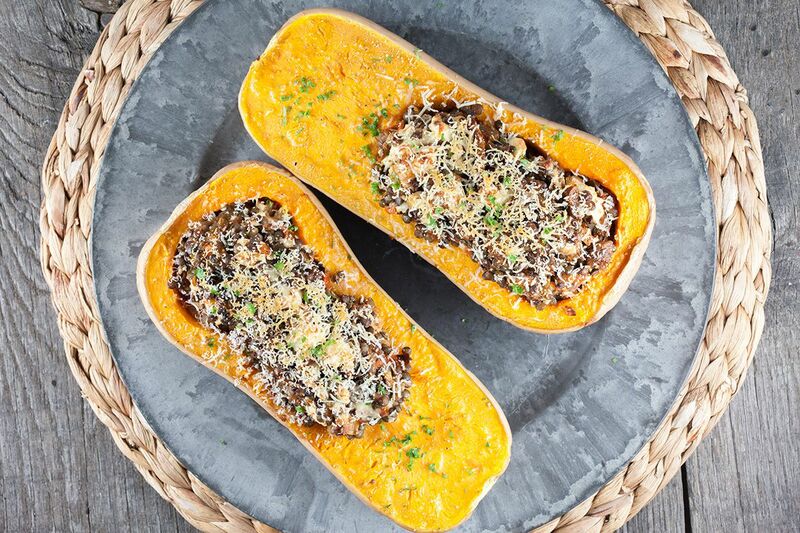 REMOVE the seeds with a spoon and drizzle the butternut squash with olive oil, pepper and salt on both sides. PLACE the butternut squash on the oven tray with the cut side pointing up. BAKE the butternut squash for about 40 minutes, until tender. Meanwhile create the filling. RINSE the lentils with cold water and boil them in water with salt, or use vegetable stock instead for more flavor. Cook the lentils according to the package, depending on the lentil type. The ones we used, had to boil for 15 minutes. PEEL and finely chop the shallot and garlic cloves. REMOVE the stems from the dried figs and chop the figs and apricots in small pieces. CUT the tomato in quarters and REMOVE the tomato seeds. Cut the tomatoes into small pieces. HEAT olive oil in the small skillet and saute the finely chopped shallot and garlic for a minute on medium heat. 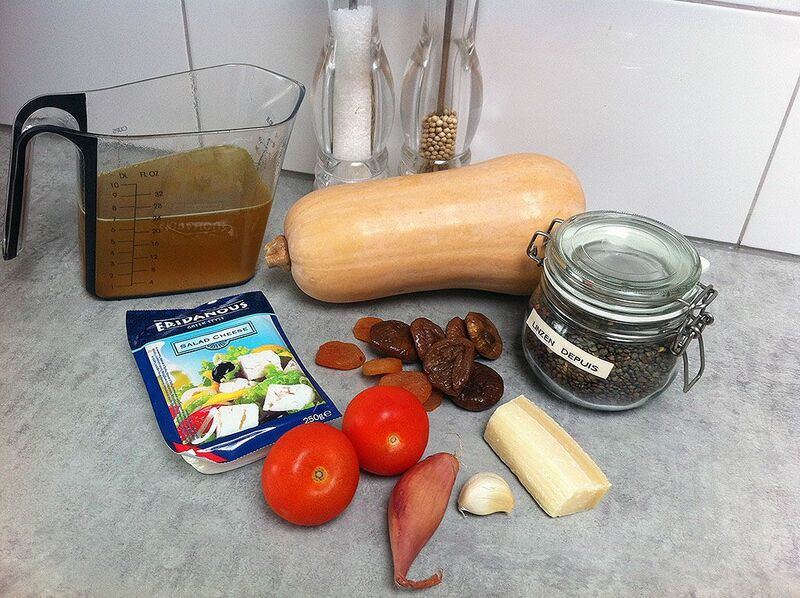 ADD the tomato pieces, dried figs and apricots. DRAIN the cooked lentils and add them to the mixture. Crumble the feta cheese into the filling and season with pepper and salt. 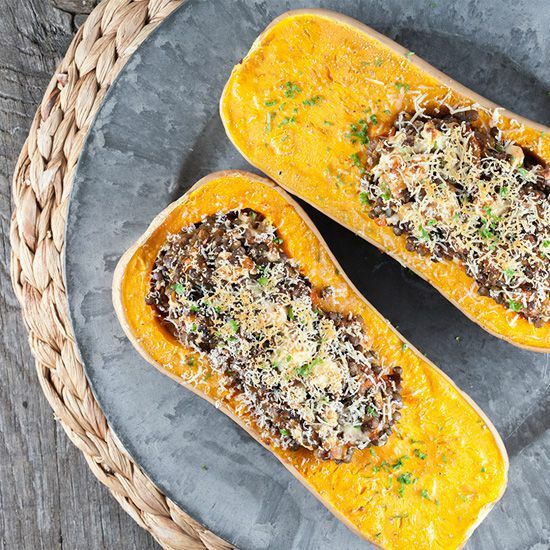 If your butternut squash only has a small hole to put the filling in, it’s recommended to use a spoon to enlarge it so there’s more space for the filling. 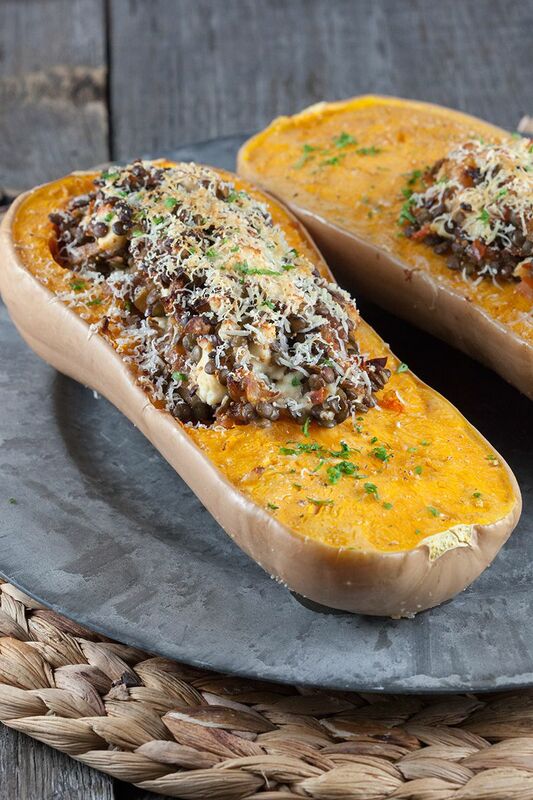 DIVIDE the filling over the butternut squash and finish it off with grated Parmesan cheese. PLACE in the oven for 15 minutes more. If your oven has a grill setting you can use it to create an extra golden brown crust. Garnish with finely chopped parsley and enjoy!